Gentianales is an order of flowering plants, included within the asterid clade of eudicots. It comprises more than 16,000 species in about 1,138 genera in 5 families. More than 80% of the species in this order belong to the Rubiaceae family. The following phylogenetic tree is based on molecular phylogenetic studies of DNA sequences. 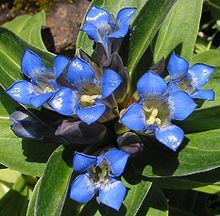 It takes its name from the Gentianaceae family, which in turn is based on the name of the type genus Gentiana. The genus name is a tribute to Gentius, an Illyrian king. Well-known members of Gentianales are coffee, frangipani, Gardenia, gentian, oleander, and periwinkle. ^ a b Angiosperm Phylogeny Group (2009). "An update of the Angiosperm Phylogeny Group classification for the orders and families of flowering plants: APG III". Botanical Journal of the Linnean Society. 161 (2): 105–121. doi:10.1111/j.1095-8339.2009.00996.x. ^ Backlund M, Oxelman B, Bremer B (2000). "Phylogenetic relationships within the Gentianales based on NDHF and RBCL sequences, with particular reference to the Loganiaceae". American Journal of Botany. 87: 1029–1043. doi:10.2307/2657003. Wikimedia Commons has media related to Gentianales. This Gentianales-related article is a stub. You can help Wikipedia by expanding it. This page was last edited on 16 February 2018, at 02:53 (UTC).